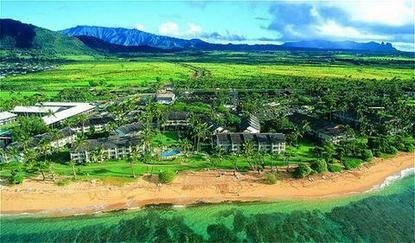 The ResortQuest Islander on the Beach is on the East Coast of Kauai at the Coconut Plantation Resort Area. This low-rise resort is set in six acres of beautifully landscaped gardens and swaying palm trees.All guest rooms were recently redecorated and have private lanais. To make a breakfast on the lanai more convenient, coffee makers and mini-refrigerators are in every room. Daily maid service is, of course, provided.Guests can relax by our beachfront swimming pool and jet spa or take a walk on the beautiful white sand beach. Public tennis courts are only half a mile away and the Wailua Municipal Golf Course is only a little over a mile from the hotel. The Coconut Plantation marketplace, with more than 60 specialty shops and restaurants, is just a short stroll away.The ResortQuest Islander on the Beach offers friendly Aloha Spirit in a lovely setting combined with Kauai's best oceanfront "deal". *** HAWAII*S NON-SMOKING LAW ***In the interest of the good health of all our guests,employees and owners, and in compliance with the StateLaw Act 295, ALL ResortQuest Hawaii hotels and condominiumunits managed by ResortQuest Hawaii are now designatedas Non-Smoking Accommodations effective immediately.